Ever-popular creative play kitchen toys and play food are great fun for chefs-to-be. Help children to learn about food preparation and nutrition. Large 7 pc kitchen set with working oven door, slide out tray and accessories for the aspirings chefs. Value 6 piece play cooktop is approx. 12" long, features bright colors and durable plastic. 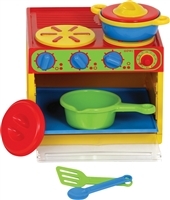 Bright 12 pc cooking set is great fun for little helpers. A perfect addition to the cooktop or stove, the 52 pc deluxe set includes both cooking and serving accesories. Little bakers love to "help" make holiday cookies and delicious deserts with this fun baking set. Extra 17 pc. 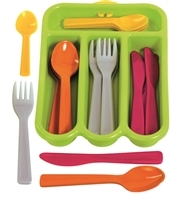 utensils set, because there are never enough! Favorite 40 pc. 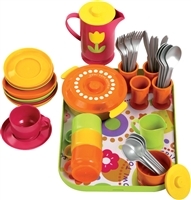 tea party or picnic service for 4 includes everything needed for a fun tea party or picnic! As brightly colored and healthy looking as the real thing, this 28 pc. selection of vegetables is an ideal addition to Gowi Toys kitchen playsets or as a separate creative play item. As brightly colored and healthy looking as the real thing, this 22 pc. selection of fruit and cheese is an ideal addition to Gowi Toys kitchen playsets or as a separate creative play item. As brightly colored and healthy looking as the real thing, this 33 pc. selection of bread, deserts and more is an ideal addition to Gowi Toys kitchen playsets or as a separate creative play item. Tea party for 4 best friends! 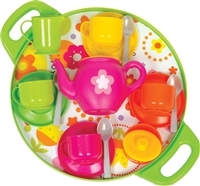 This 40 pc dinner service for 4 set features everything your little one will need to host the perfect dinner party.